Big Win for the Highlands! The New Jersey Senate voted Thursday, May 25th in favor of a joint resolution that finds DEP in violation of legislative intent for increasing the density of septic system-dependent development in the Highlands’ Preservation Area by amending and weakening the septic density provisions of the Department's Highlands Rules. As an administrative formality, the Senate substituted the Senate version with the Assembly version of the concurrent resolution, ACR-192, which then passed in a 22-14 vote. The Assembly must concur with amendments that were added by the Senate Environment Committee earlier in May. We expect the Assembly will move to concur at the next voting session on June 8, which will trigger a 30-day window during which DEP must amend the rule. If DEP fails to amend the rule, the rule is invalidated by concurrent resolutions passed in both houses. Because the 30-day period ends after the Legislature breaks for summer recess, action to invalidate the septic density rule must wait until the Fall. Amy Miller grew up in Branchburg, NJ and is a student at Centenary University in Hackettstown, NJ from which she will receive her bachelors in Environmental Science in December of 2017. She recently completed interning with the New Jersey Highlands Coalition where she has learned a great deal about how to promote events, network with other organizations and effectively share a non-profit’s mission. We have appreciated all of Amy's hard work and enthusiasm at the Coalition where she has participated in some great projects and events throughout her internship. Amy has always known she wanted to help preserve the environment, when at a young age she testified at her hometown’s municipal building about local deforestation. Years later the town named an ordinance after her, Amy’s Law, requiring when you remove a tree one must be planted in its place. She is an advocate at her University and helped run a petition to start the new recycling program this past April. She mentors Freshman Biology students and has a passion to help people become the best version of themselves they possibly can. Amy dreams of working as a public relations representative to bridge the gap between the public and the scientific research community. The May council meeting was one not to be missed. The Council’s work session began with introduction to Council members of the Draft Highlands Regional Plan Monitoring Program Recommendation Report (MPRR). The process for creating sections of the MPRR was presented and, after some discussion, a vote was taken to release the MPRR to the public with a 60 day comment period. It did not pass with seven positive votes; eight votes are necessary. Council member Walton then moved release of the MPRR with a 90 day comment period. To some Council members’ dismay, this also didn't pass. Seven members felt they need more than the few days provided to review the proposed MPRR before they are informed enough to vote to release it. Council Executive Director, Margaret Nordstrom, stated that the Council will now be the agency responsible for dispersing Highlands Conservation Act open space funds. Please plan on attending the next Council meeting where the MPRR will most likely be brought up again in an effort to release it to the public for comment. 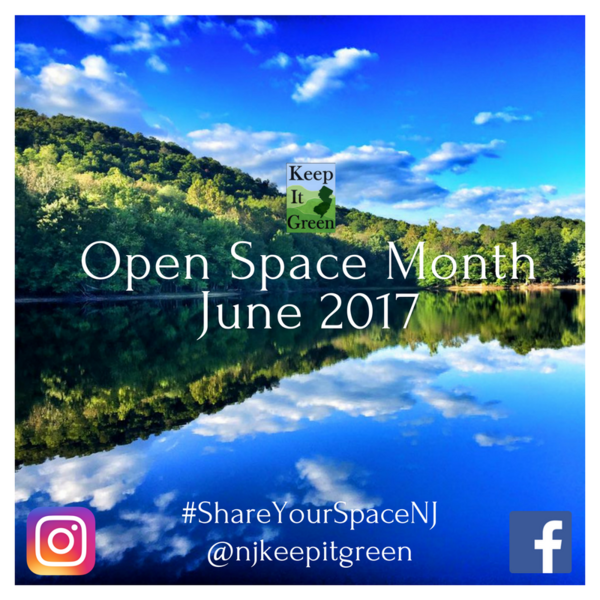 June is Open Space Month! 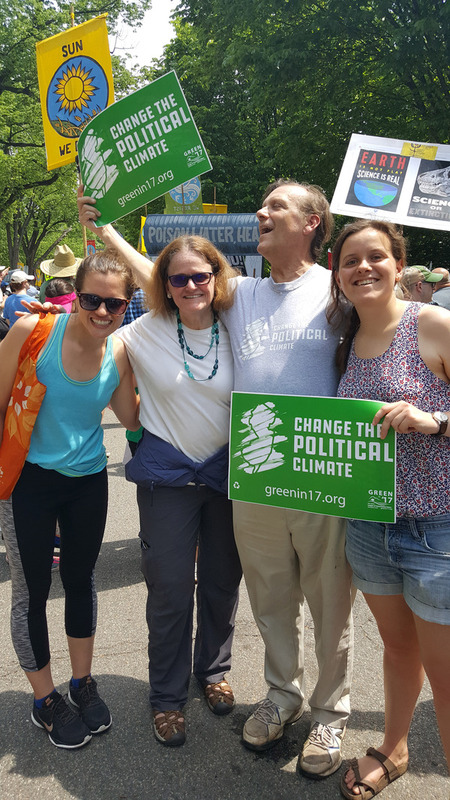 On April 29, organized by the New Jersey League of Conservation Voters, the NJ Highlands Coalition co-sponsored two large buses filled with folks heading to Washington DC for the People's Climate March. A huge shout out to all the Coalition members who joined us for a fun and truly memorable day. Oh boy, was the weather hot! The hottest April 29 on record in Washington DC! The bus I joined at 6 am in Morristown moved smoothly to RFK Stadium in DC where we were joined by literally hundreds of other buses disgorging their passengers from as far away as Ohio and North Carolina. 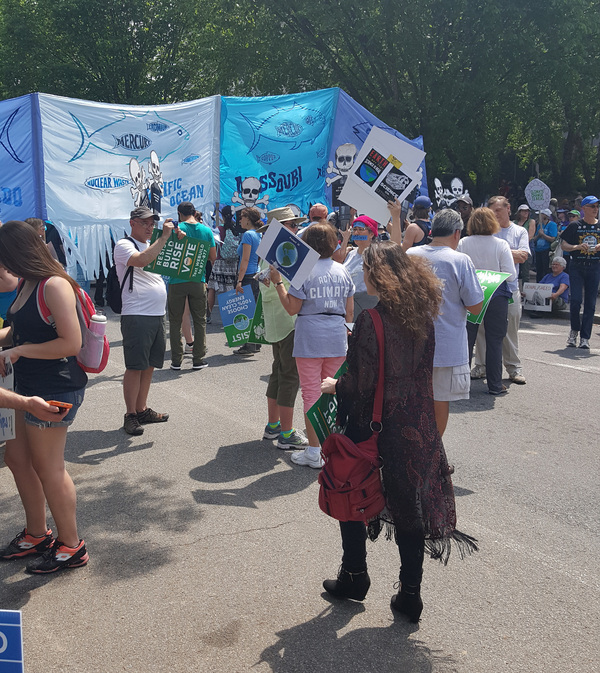 From there, we took the metro to the March, a remarkable experience of more than 200,000 people marching to demand that our legislative leaders recognize that climate change is happening, that it is caused by human activity, and that we take action now to start to protect us from the consequences. It was an extraordinarily peaceful event, with barely a single policeman to be seen, peopled by an impressive cross section of society and age groups. I was particularly struck by the elderly lady, moving with the assistance of awalker, heading with a companion for the Metro to participate. When I told her how impressed I was that she was there, she was professed surprise -- that this event was too important to miss! Whole families with young children marched, serenaded by bands of people carrying/playing musical instruments -- not always well, but always enthusiastically. And the creativity of the signs people carried and the costumes they wore made the long, hot day a memorable and surprisingly joyous one, not likely to be recreated any time soon. I don't think there was a person on the bus returning to Morristown who wasn't thrilled about having been a small part of history in the making. Thanks to NJLCV for making the trip happen! Have you been to our pub crawls in the past? If so, you know how fun it can be to promote and support a good cause like clean water in New Jersey! If you haven't, here's a chance to join the clean water, great craft beer movement and celebrate Hopped Up NJ! Look out for our Boonton Pub Crawl in September and our Morristown Pub Crawl in October. 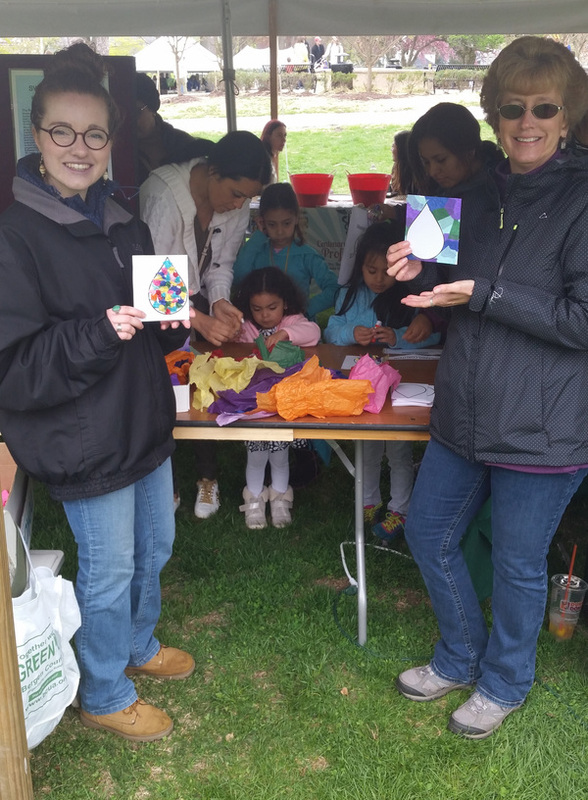 Local grassroots organizations focused on protecting water and other environmental resources or preserving cultural and historic treasures in the New Jersey Highlands can apply for grants up to $5,000 through the New Jersey Highlands Coalition‘s 2017 Small Grants Program. The cultural grants include “bricks-and-mortar” projects for specific historic sites or districts. Applications must be received by Friday, June 16. 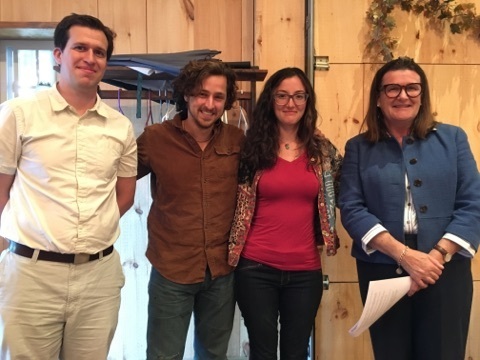 Grants will be awarded on Wednesday, Oct. 11, at the N.J. Highlands Coalition’s annual meeting. 5. Educate the public about Highlands cultural resources or water and other natural resources. Grassroots applicants are advised to view the full guidelines for the program on the Coalition’s website HERE. This is especially true of the new cultural and historic grants where detailed requirements for this third-year program are included on the website. Our outreach has now expanded to other efforts seeking local and governmental support. We, of course, will still approach targeted towns outside the Highlands that receive water from the Highlands to approve our Resolution of Support for the Highlands Act. But now, we are working with the Keep It Green Campaign on resolutions advocating continued funding support for Open Space acquisition. 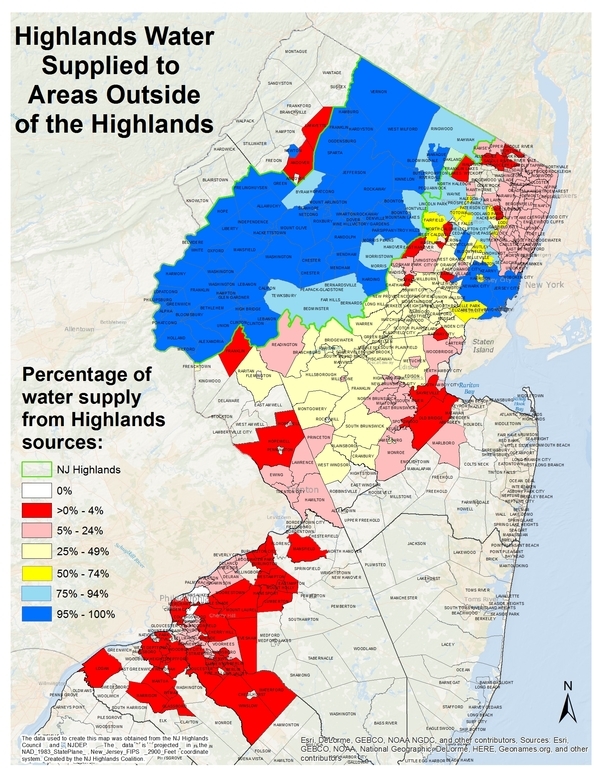 We had also worked with SaveH20NJ on a resolution supporting the release of the long delayed New Jersey Water Supply Plan, which was finished in 2011 but had not been released to the public, informing and supporting local and regional planning decisions. The Water Supply Master Plan has just been released by NJDEP and is out for public comment until June 30th. Communities as diverse as Bernardsville, Newark and George Stafford’s home town of Wharton have recently signed on to both of these resolutions. Political events both in Washington and here in New Jersey have made the local and regional government/political picture somewhat cloudy, but we continue to meet with officials inside and outside the Highlands in places like Stanhope and Paterson, and to promote the important economic and environmental values of the Highlands.